Hand Butter Churn will churn 2.5 quarts of cream into fresh delicious butter in approximately 25 minutes. 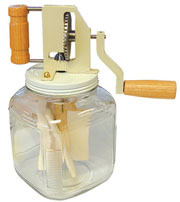 Churn features a 4-to-1 gear ratio, balanced grip, steel machine-cut gears, steel frame, nylon bearings, maple wood paddles (dasher), oak handle and thick Anchor-Hocking glass jar. Very stable, low-center of gravity design. Fully assembled and ready to use, instructions are included. (For replacement glass jar, order stock no. 45102). Ship weight of complete churn is 10 lbs.